STM has got cables nailed. Although we’ve come across STM’s cable-ready organisation prowess before, the ability to put a laptop in one area and thread a power cable through various ports to any another part of the bag is an excellent idea. Used around an airport, it means you store a power cable in the front pouch and recharge a laptop without getting it out of the bag. Ingenious! Elsewhere, the Banks is relatively standard fare for a small backpack, albeit it with a few surprises. It totals 18 litres capacity, but the headline feature is a slightly raised section at the back that can take a 15-inch laptop. There’s also a nicely-sized two-slip section on the inside layer that can take both an iPad and A4 paper. Most of 18 litres can be stored in the middle section, which has another A4 sized pocket on one side, and a shallow, felt-lined pocket at the top on the other, which is primarily for sunglasses. Rather unusually, there is a keyring clip attached mid-way up this section’s wall, which is for securing something you do not usually find included with an ‘urban’ backpack; a separate wash bag. Small, zipped, and with no separate compartments within, we are not convinced that this is particularly useful. Though a transparent version would have been appropriate for those travelling through airports regularly. The front of the bag has a small hidden zipped pocket, though most of it is taken up by a chubbier pouch at the bottom that contains most of the bag’s fiddly organisational pockets. It has a couple of passport-sized pouches for documents and photos, a zipped section, and another keyring clip. This pocket is perhaps too small for all that, and proved a bit fiddly to access during use. That front pocket is where we stored our power pack for a laptop, threading the cable back through the bag’s ports to the laptop sleeve. However, when it comes to power, the Banks presumably gets its name from a hidden pocket in the main compartment for holding a portable smartphone battery. That’s a nice idea in theory, but in practice these batteries are operated by pressing a button on their side, which means hiding it in a secret pocket is rather inconvenient. In practice we didn’t use this pocket, preferring to keep the battery higher up in the bag, and thus easier to access and operate. 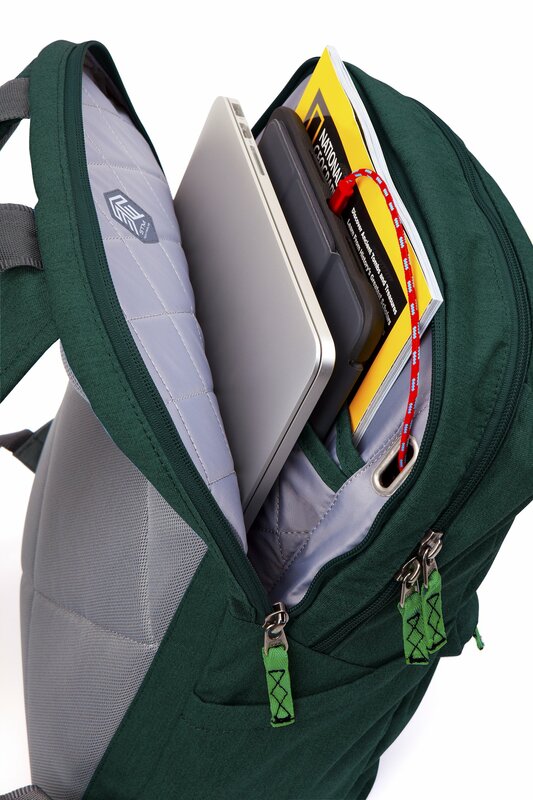 Although the cable-ready system is better employed on STM’s Haven backpack (thanks to that bag’s separate zipped side-pocket for wall chargers) it’s great to see a design that encompasses so many pockets, padded areas and organisational pouches that link together. It would also be nice to find stretch pockets on the outside rather than the rather restrictive designs, but this is tough, comfortable, and highly functional bag is nevertheless a great choice for taking on a work trip or as carry on luggage in the cabin.